The story as I understand it is that since Chris Squire was the ONLY consistent member of Yes, somehow he had legal right to the name. So since Anderson, Bruford, Wakeman, and Howe couldn't put an album out under the Yes moniker, they opted to use the name Anderson, Bruford, Wakeman, Howe. This new Yes, er uh, I mean A.B.W.H. album is phenomenal. Maybe not quite up to par with the classic Yes albums, but darn close. I have the video for this album as well. Found it at Wal-Mart for .99 cents. b. "Owner of a Lonely Heart"
Another fine Yes album, although not under the Yes name. Whatever! This is a beautiful disc. The first disc features a lot of solo stuff, but after that we are treated to some of the best of Yes' catalogue as well as selections from the A.B.W.H. album. 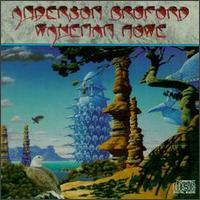 More Roger Dean cover art.